Don Giovanni has always been one of my favourite operas. Mozart's music is typically phenomenal, but there is also a dark, complex story and Mozart's most vivid titular character in Don Giovanni. This SF production I did very much like, however if I were asked whether it was my first choice of productions of Don Giovanni, I'd answer that the Losey film, 1955 performance with Siepi, 1987 performance with Ramey, 1990 production with Ramey again, 2000 production with Terfel and Fleming and 2001 production with Gilfrey are slightly stronger contenders. But this doesn't make this Don Giovanni any less than compelling. It is a stark-looking production, with splotched grey sets; some looking for sumptuous settings will be disappointed, those who don't mind so much won't be. I personally would have preferred a less stark approach, but considering the darkness and complexity of Mozart's opera it did sort of work. Plus there are still some striking features, especially the titled floor covering the stage. The costumes are effective too, especially those of Donna Anna and the Commendatore. As for the musical side of the production, this Don Giovanni excels. The orchestra's is wonderfully foreboding at the start of the Overture and during the final Commendatore scene(always has been one of the highlights of the opera for me), play with gusto during the Champagne aria and prove to be sensitive accompanists during the recitatives and for La Ci Darem La Mano. Donald Runnicles' conducting shows authority and a complete command for Mozart's score, with the recitatives actually moving the story forward rather than plodding. The performances also add much to the production. 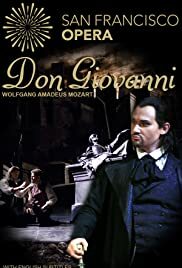 The obvious starting point is the Don Giovanni of Mariusz Kwiecien, who had previously impressed me in three performances at the Met, as Don Giovanni(again), as Enrico in Lucia Di Lammermoor and as Maletesta in Don Pasquale. While handsome, charming(at times) and with a hint of subtlety, Kwiecien does portray the Don as mostly(as he should be I think) a bad boy, meaning he is cruel, sometimes violent, self-indulgent, manipulative and devilish. Kwiecien's acting is commanding and singing reasonably rich and characterful without resorting to blustering. Other than Kwiecien, the one who stood out for me was Elza Van Den Heever's Donna Anna. Passionate and fiery, yet with a sympathetic side, Heever's singing is powerful(perhaps too powerful in the ensembles but still impressive) with a more than decent colouratura and agility and secure legato. Or Sai Chi L'Onore is very moving, both vocally and how the scene was staged. Charles Castronovo is an Ottavio of purity, although the role can be rather thankless, and he sings with perfect leggiero and understanding of the Mozart style. Il Mio Tesoro is particularly impressive. Twyler Robinson is a spiteful, sympathetic and perfectly bounteous Elvira, the character who perhaps provides the heart of the opera, with a good attractive voice. This was her first major role for San Francissco, but you wouldn't think so looking at or hearing her here. Claudia Mahnke is warm and adorable as Zerlina. Batti Batti is memorable. Luca Pisaroni is not quite as exciting as he was as Guglielmo in 2006's Cosi Fan Tutte or especially as Leporello for the recent Met production of Don Giovanni, but considering that Massetto is not as interesting as those two characters, his handsome stature, rich voice and sense of humour makes the character here memorable.